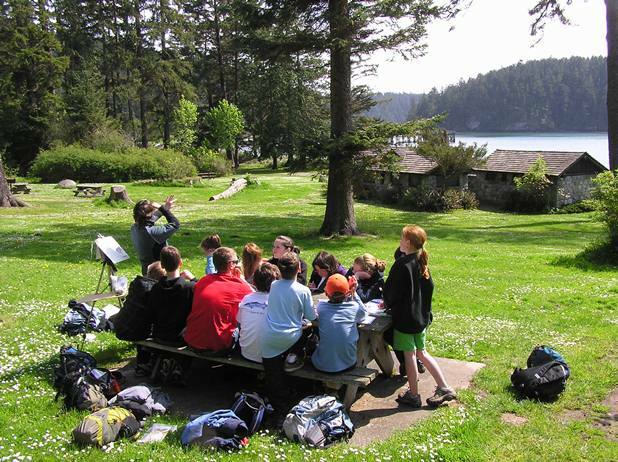 Environmental & Adventure School (EAS) is a Lake Washington School District "Choice School" serving 6th through 8th grade students. The school was founded in 1999 by teachers envisioning a highly engaging and challenging academic environment that would meet the needs of developing middle school students. EAS challenges students with powerful opportunities to learn and grow academically, socially, and as active citizens in their communities. Why the theme of "Environment"? Environment includes the various contexts in which we live, learn, and work as well as the natural environments in our world. Students develop an understanding of how people influence and are influenced by their environments and develop a responsibility for creating and sustaining healthy environments. This becomes the theme in which we integrate topics of social studies, science, and health. Students read, write, and apply scientific and mathematical procedures while conducting meaningful research and investigations. Evidence from the study strongly supports the conclusion that students' self-discipline and behavior improve when they are involved in environment-based, hands-on, minds-on activities that engage and challenge them. Evidence also indicates that students' language arts skills improve in three different ways: 1) reading with improved understanding, 2) writing more effectively, and 3) speaking with increased skill and confidence. Lieberman, Gerald A., Ph.D. and Linda L. Hoody, M.A. "Closing the Achievement Gap: Using the Environment as an Integrating Context for Learning." San Diego: State Education and Environment Roundtable. 1998.